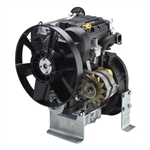 Kohler 6HP Diesel Engine, Recoil and Electric Start, Perfect for Tractors, Log Splitters, Pressure Washers, Pumps, Air Compressors, and many other Commercial Uses. This 6HP diesel engine ships by freight. FREE SHIPPING to a commercial address with a loading dock, or to your local trucking terminal. Residential Delivery will be extra. Please contact us for more information on this small diesel engine. *Photo says 6.7HP actual output is 6.1HP. *Stock Photo. Kohler Diesel Engine, 9 HP Engine, Electric Start and Recoil Start, Perfect for Tractors, Log Splitters, Pressure Washers, Pumps, Air Compressors, and many other Commercial Uses. This Item ships by freight. FREE SHIPPING to a commercial address with a loading dock, or to your local trucking terminal. Residential Delivery will be extra. Please contact us for more information. 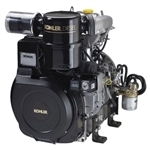 Kohler 15HP Diesel Engine Liquid Cooled, Small Diesel Engine, Electric Start and, Perfect for Tractors, Log Splitters, Pressure Washers, Pumps, Air Compressors, and many other Commercial Uses. 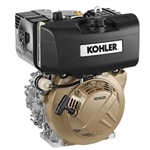 Kohler 23 HP Engine, Liquid Cooled Diesel Engine, Electric Start and, Perfect for Tractors, Log Splitters, Pressure Washers, Pumps, Air Compressors, and many other Commercial Uses. This engine has a variable speed throttle. Kohler 25 HP Diesel Engine, Small Diesel Engines, Electric Start and, Perfect for Tractors, Log Splitters, Pressure Washers, Pumps, Air Compressors, and many other Commercial Uses.